Biology Teachers teach biology basics to the high school students at educational institutes. 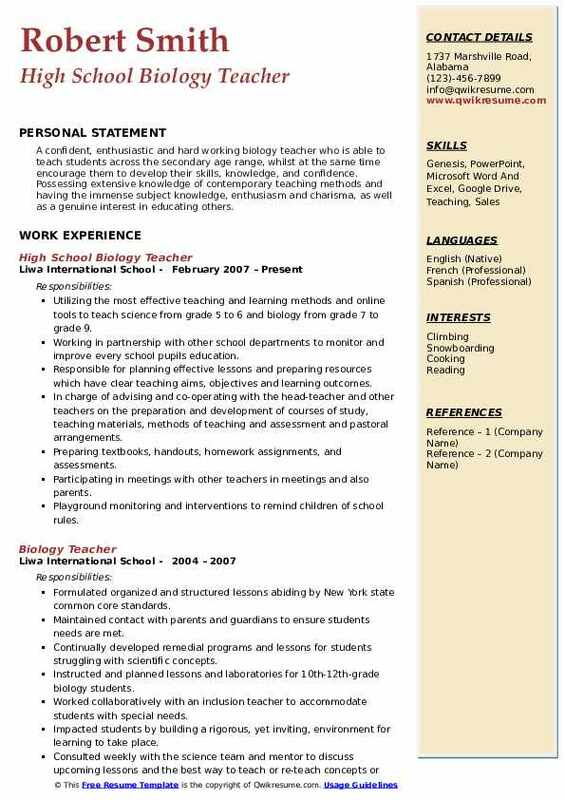 The major roles and responsibilities depicted on the resume include – engaging curricula such as lab experiments, demonstrations, and other specific investigations, presenting lessons, evaluating student performance and grading tests. 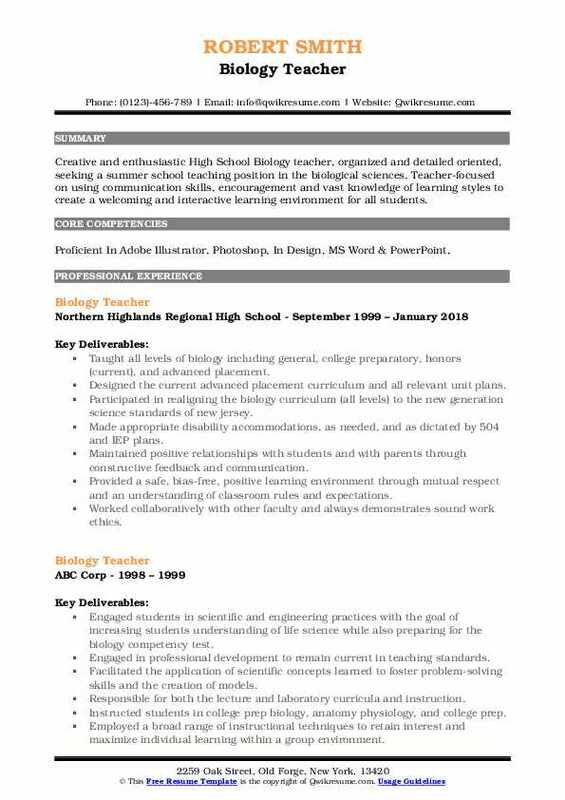 The other tasks mentioned on Biology Teacher Resume include – supervising student behavior, instructing students on the study of living things, holding seminars and lectures, writing grant proposals, and utilizing various curriculum resources. Biology Teachers should be able to keep their students engaged and on task, they should as well employ various teaching strategies to meet each student’s needs, they should have the potential to simplify and teach the students complicated topics and have strong interactive skills. This post typically needs a four year Bachelor of Science degree in biology education as a major or specialty. Master’s degree normally falls in limelight. Headline : Currently working as a Biology Teacher with six years of teaching experience in an urban, economically disadvantaged school district. For the previous six years, I have designed and implemented practical lab-based exercises that demonstrate the fundamental principles of biology across multiple subfields such as anatomy and physiology, cell biology, and biochemistry. This, in turn, has allowed me to become adept at the laboratory techniques necessary to be successful in these fields. Courses taught: Introductory Biology, Honors Introductory Biology, International Baccalaureate (IB), Biology Levels 1 2, Anatomy Physiology, Remedial Biology. Taught biology to socioeconomically disadvantaged students of varying levels of content mastery, ability, and English language proficiency at a level 4 urban high school. Designed and administered standards-based academic evaluations and maintained an accurate. Designed and implemented units and lessons according to the framework of the international baccalaureate programs middle years program and diploma program. Secured grant money to fund the purchase of laboratory supplies and equipment, and training for teachers to use new equipment. Managed the spending of grant awards: liaised with company representatives, purchased, received, assembled, and maintained equipment purchased with grant money, and coordinated professional development to train teachers to use new equipment in their classrooms. Served on the school's curriculum committee for reaccreditation through NEASC. Summary : Top-performing Biology Teacher with over 23+ years of progressive experience in teaching diverse courses in biological sciences. Exceptional focus on developing curriculum in sync with student individual requirements and limitations. Excel in: Developing and implementing lesson plans aimed at providing students with advanced comprehension of biological sciences. Communicating effectively with students at different technology levels to support advanced educational goals. Oversaw the department budget, schedule, curriculum, and serving as a liaison between the science department and building and district administration. Oversaw the writing of the curriculum for all the levels of 10th-grade biology. 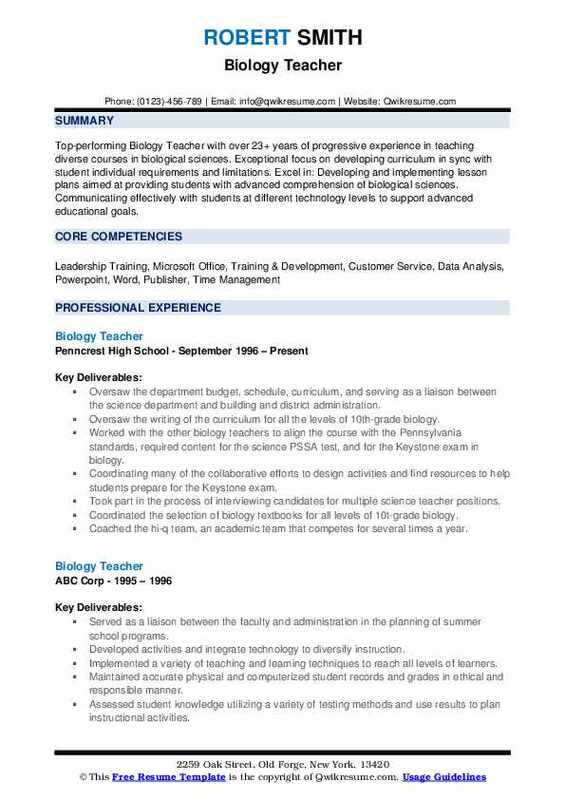 Worked with the other biology teachers to align the course with the Pennsylvania standards, required content for the science PSSA test, and for the Keystone exam in biology. Coordinating many of the collaborative efforts to design activities and find resources to help students prepare for the Keystone exam. Took part in the process of interviewing candidates for multiple science teacher positions. Coordinated the selection of biology textbooks for all levels of 10t-grade biology. Coached the hi-q team, an academic team that competes for several times a year. Changed the structure of the program to its present form by researching other local programs and proposing the revisions to the school board, which resulted in increased enrollment overall in the summer program. 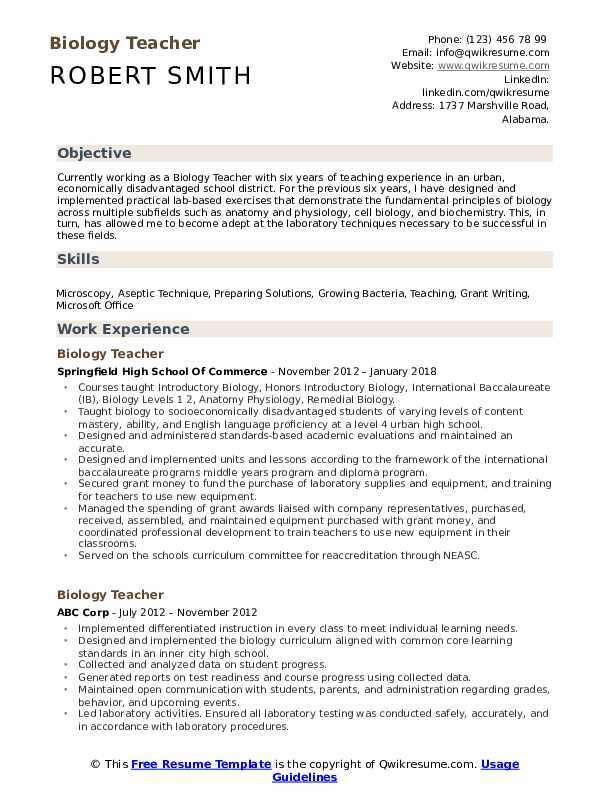 Objective : Resourceful and determined Biology Teacher with over 3 years of teaching experience. 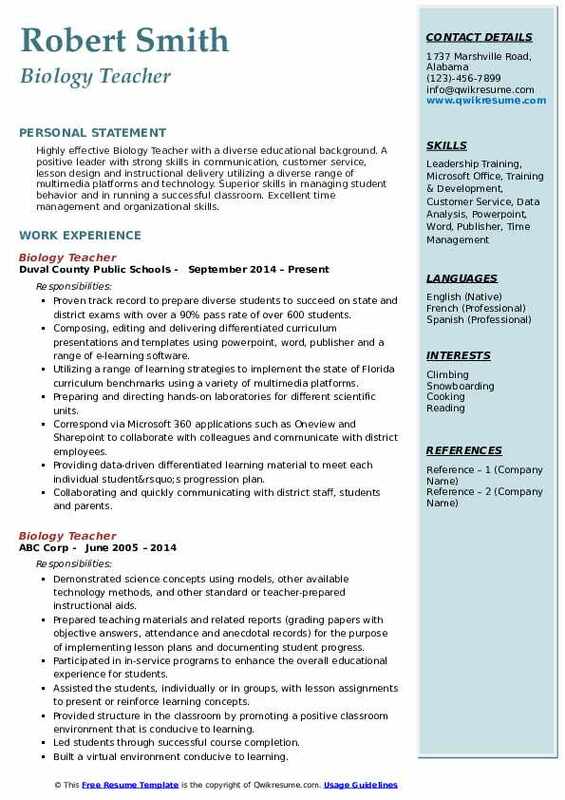 Very passionate with excellent capabilities in building student rapport and cooperative professional relationships with parents, staff, and administration while effectively educating students in complex subject matters. Communicating goals and expectations for all students and clearly present information about complex science topics to give students identifiable goals and course objectives. Providing the students with classroom social and behavioral accountability contract that collectively includes school and classroom rules and regulations to maintain a fluid learning environment for all students. Modifying general education curriculum for special-needs students Individual Education Plans (IEP) based on a variety of instructional techniques and technologies. Overseeing the inventory activities, including materials monitoring, ordering or requisition, and supply stocking or re-stocking or laboratory supplies. Demonstrating safety, best practices and proper equipment and materials handling of laboratory equipment to students. Liaisoning for instructing other educators on the use of Google voice to implement in the classroom. Mentoring new teachers on classroom management and communicated with principals on effective strategies for new educators. 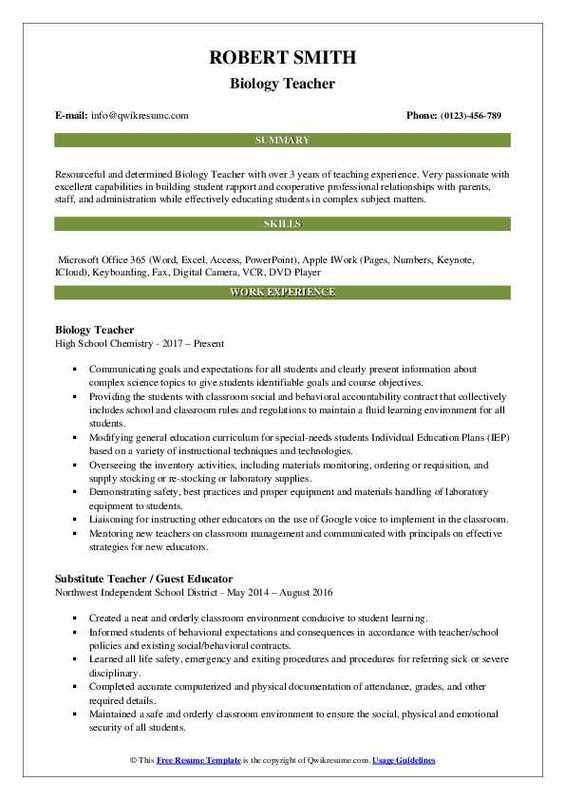 Objective : Energetic, results-oriented Biology Teacher eager to bring strong administrative skills to a company in need of top-level support. Performing curriculum-based experiments in a lab setting, targeted to assist students in understanding biological procedures. Curriculum Development, Research Project Support, Integration Technologies, Student Evaluation, Laboratory Work Monitoring, and Assessment. Creating a warm stable classroom environment that encourages students to meet or exceed both personal and district standards. Increasing rigor of department-maintained lessons to help the student reach their full potential. Welcoming and maintaining positive relationships with students, parents, fellow teachers, and all support staff. Maintaining accurate, detailed records of student attendance, grades, achievements, and behaviors using district software. Integrating the use of technology and computer systems for class work when appropriate. Developing a curriculum to hold student interest and encourages high rates of participation and growth. Ensuring that lessons and curriculum comply with policy and regulation of school district. Participating in extra-curricular activities including orientations, open house, school events, sports, and workshops. 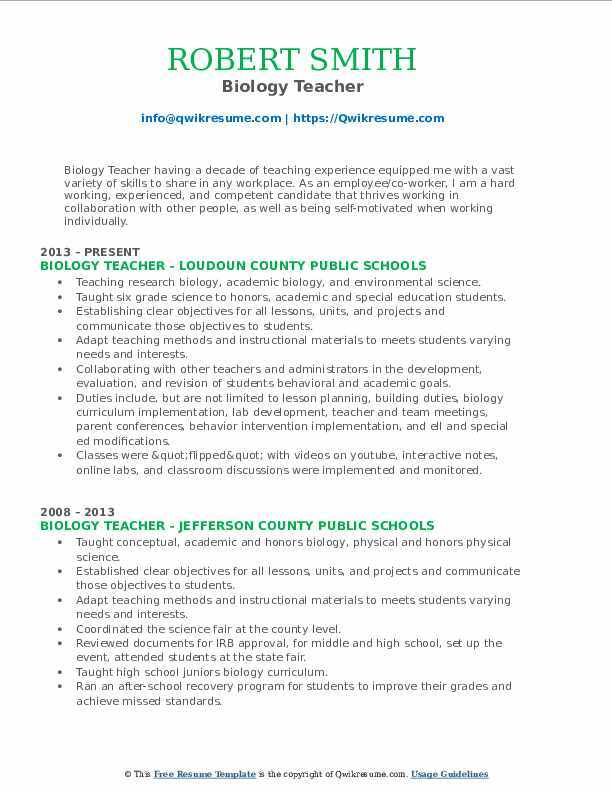 Summary : Highly effective Biology Teacher with a diverse educational background. A positive leader with strong skills in communication, customer service, lesson design and instructional delivery utilizing a diverse range of multimedia platforms and technology. Superior skills in managing student behavior and in running a successful classroom. Excellent time management and organizational skills. Proven track record to prepare diverse students to succeed on state and district exams with over a 90% pass rate of over 600 students. Composing, editing and delivering differentiated curriculum presentations and templates using powerpoint, word, publisher and a range of e-learning software. Utilizing a range of learning strategies to implement the state of Florida curriculum benchmarks using a variety of multimedia platforms. Preparing and directing hands-on laboratories for different scientific units. Correspond via Microsoft 360 applications such as Oneview and Sharepoint to collaborate with colleagues and communicate with district employees. Providing data-driven differentiated learning material to meet each individual student’s progression plan. Collaborating and quickly communicating with district staff, students and parents. Accommodating students daily with IEP and section 504 plans required by law. 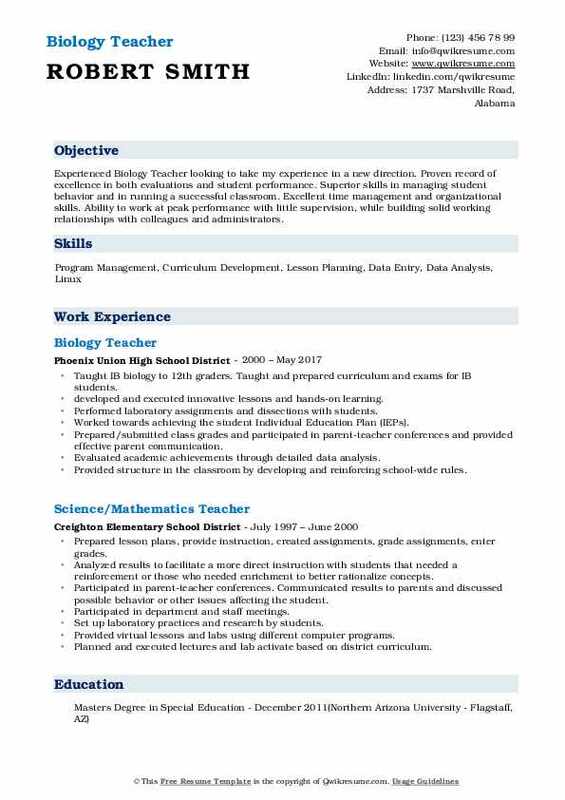 Summary : Experienced Biology Teacher looking to take my experience in a new direction. Proven record of excellence in both evaluations and student performance. Superior skills in managing student behavior and in running a successful classroom. Excellent time management and organizational skills. Ability to work at peak performance with little supervision, while building solid working relationships with colleagues and administrators. Taught IB biology to 12th graders. Taught and prepared curriculum and exams for IB students. developed and executed innovative lessons and hands-on learning. Performed laboratory assignments and dissections with students. Worked towards achieving the student Individual Education Plan (IEPs). Prepared/submitted class grades and participated in parent-teacher conferences and provided effective parent communication. Evaluated academic achievements through detailed data analysis. Provided structure in the classroom by developing and reinforcing school-wide rules. Cooperated and participated with the science team and co-workers in ongoing training sessions and PLCs to enrich biology curriculum. Summary : Biology Teacher having a decade of teaching experience equipped me with a vast variety of skills to share in any workplace. As an employee/co-worker, I am a hard working, experienced, and competent candidate that thrives working in collaboration with other people, as well as being self-motivated when working individually. Teaching research biology, academic biology, and environmental science. Taught six grade science to honors, academic and special education students. Establishing clear objectives for all lessons, units, and projects and communicate those objectives to students. Adapt teaching methods and instructional materials to meets students varying needs and interests. Collaborating with other teachers and administrators in the development, evaluation, and revision of students behavioral and academic goals. Duties include, but are not limited to lesson planning, building duties, biology curriculum implementation, lab development, teacher and team meetings, parent conferences, behavior intervention implementation, and ell and special ed modifications. Classes were "flipped" with videos on youtube, interactive notes, online labs, and classroom discussions were implemented and monitored. Blackboard, smart technologies, and google apps were an integral part of the course. 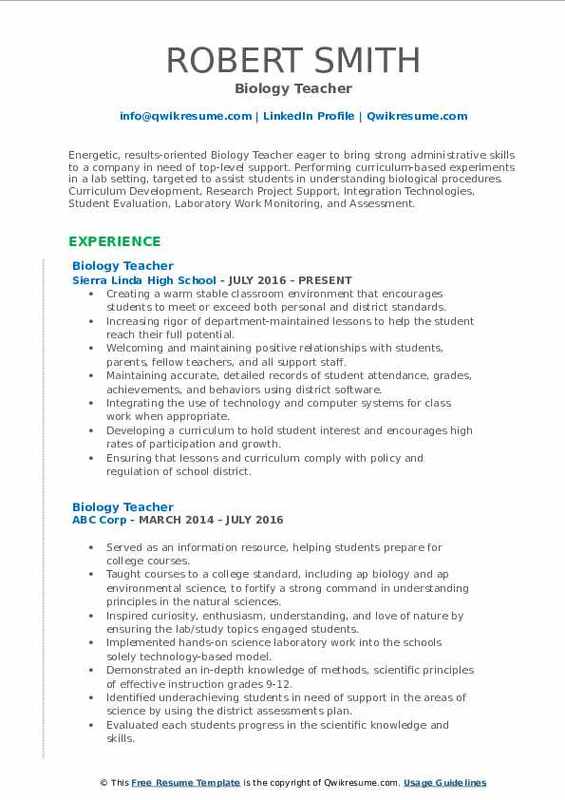 Summary : Creative and enthusiastic High School Biology teacher, organized and detailed oriented, seeking a summer school teaching position in the biological sciences. Teacher-focused on using communication skills, encouragement and vast knowledge of learning styles to create a welcoming and interactive learning environment for all students. Taught all levels of biology including general, college preparatory, honors (current), and advanced placement. Designed the current advanced placement curriculum and all relevant unit plans. Participated in realigning the biology curriculum (all levels) to the new generation science standards of new jersey. Made appropriate disability accommodations, as needed, and as dictated by 504 and IEP plans. Maintained positive relationships with students and with parents through constructive feedback and communication. Provided a safe, bias-free, positive learning environment through mutual respect and an understanding of classroom rules and expectations. Worked collaboratively with other faculty and always demonstrates sound work ethics. Responsible for both creating and maintaining records of student performance. Summary : A confident, enthusiastic and hard working biology teacher who is able to teach students across the secondary age range, whilst at the same time encourage them to develop their skills, knowledge, and confidence. Possessing extensive knowledge of contemporary teaching methods and having the immense subject knowledge, enthusiasm and charisma, as well as a genuine interest in educating others. Utilizing the most effective teaching and learning methods and online tools to teach science from grade 5 to 6 and biology from grade 7 to grade 9. Working in partnership with other school departments to monitor and improve every school pupils education. Responsible for planning effective lessons and preparing resources which have clear teaching aims, objectives and learning outcomes. In charge of advising and co-operating with the head-teacher and other teachers on the preparation and development of courses of study, teaching materials, methods of teaching and assessment and pastoral arrangements. Preparing textbooks, handouts, homework assignments, and assessments. Participating in meetings with other teachers in meetings and also parents. Playground monitoring and interventions to remind children of school rules. 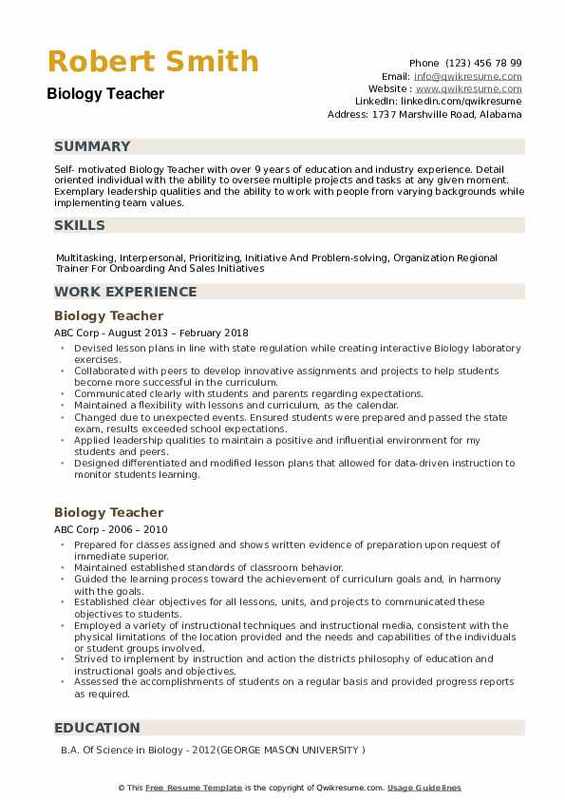 Summary : Self- motivated Biology Teacher with over 9 years of education and industry experience. Detail oriented individual with the ability to oversee multiple projects and tasks at any given moment. Exemplary leadership qualities and the ability to work with people from varying backgrounds while implementing team values. Devised lesson plans in line with state regulation while creating interactive Biology laboratory exercises. Collaborated with peers to develop innovative assignments and projects to help students become more successful in the curriculum. Communicated clearly with students and parents regarding expectations. Maintained a flexibility with lessons and curriculum, as the calendar. Changed due to unexpected events. Ensured students were prepared and passed the state exam, results exceeded school expectations. Applied leadership qualities to maintain a positive and influential environment for my students and peers. Designed differentiated and modified lesson plans that allowed for data-driven instruction to monitor students learning. Addressed the different learners in the class by offering various ways of understanding concepts required for 9th grade outlined in the framework and next-generation standards.